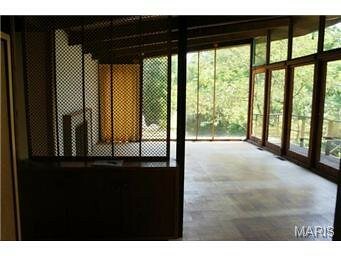 Architect Robert Elkington's residence in Manchester is currently for sale and listed as "perfect for tear down or rehab" on both Prudential and Janet McAfee's websites. 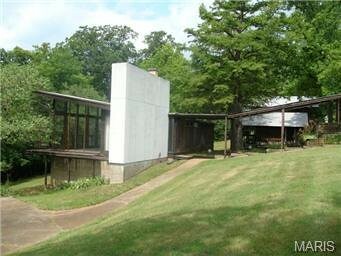 This unique Mid-Century Modern home was built in 1948 and is located at 1520 Carman Road, just under a mile west of Dougherty Ferry. Te see some better photos of this beautiful house, take a look at Ted Wight's blog post. The home is being offered "as is" at $250,000, a relative bargain for house like this on a large wooded lot. The property has 573 feet of frontage on Carman Road, and the homes position on the site would allow part of the eastern half of the property to be sold as a building lot without ruining your views, which would then give you money to polish this gem. Thanks Dustin Bopp for bringing this to attention. 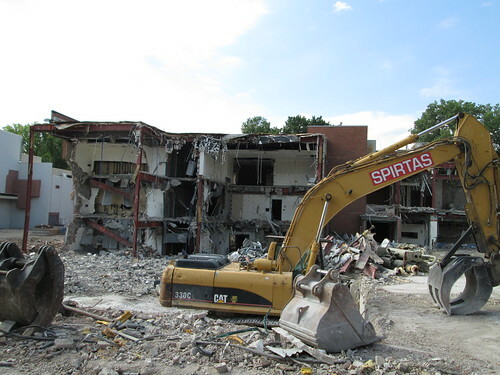 This week demolition crews were busy taking down the last of Wydown Middle School in Clayton. 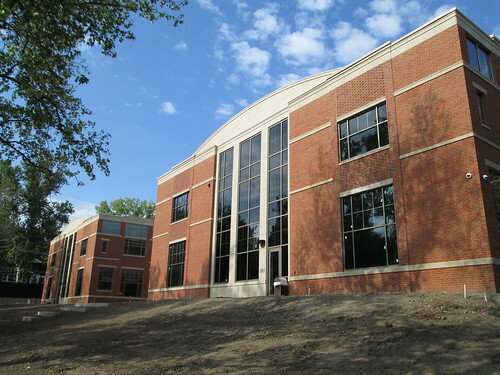 After looking at alternatives including altering/adding on to the existing building, purchasing the old CBC High School (which was later purchased by Washington University) the school is be replaced with a new building. Most of the new structure was built on the existing fields so that it would be ready for this fall. 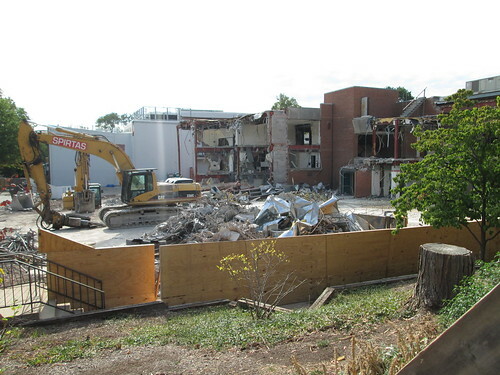 After the main wing of the old building is cleared, the remainder of the new school will be built. I can't say that I ever had much appreciation for the existing school, which was completed in 1965. 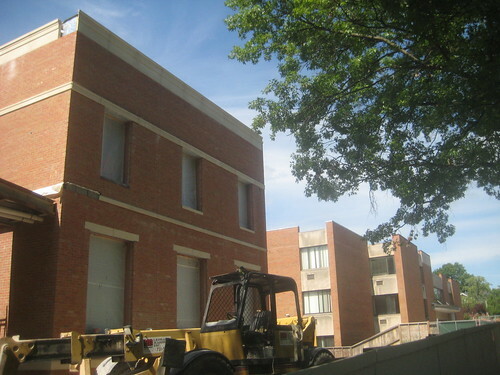 Light red-orange brick did little to soften the overall brutalist appearance of the building. The interior instead of mid-centry cool was simply dark and dated. 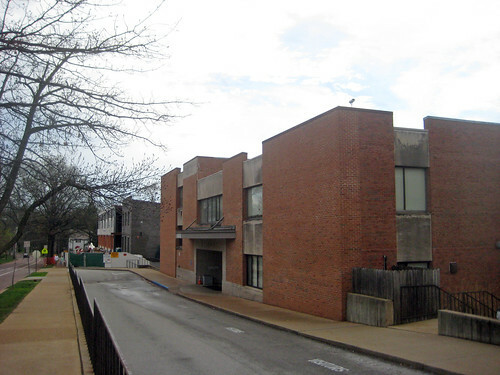 The structure lacked any component that stood out as great (or even better than good) architecture such as the soaring barrel vault wing of Murphy & Mackey's 1958 Ladue Junior High School. In contrast, the auditorium wing at Wydown was a plain brick box that looked like an afterthought with nothing but a void to say "enter here". Part of the new school building stands east of the 1965 structure earlier this year. 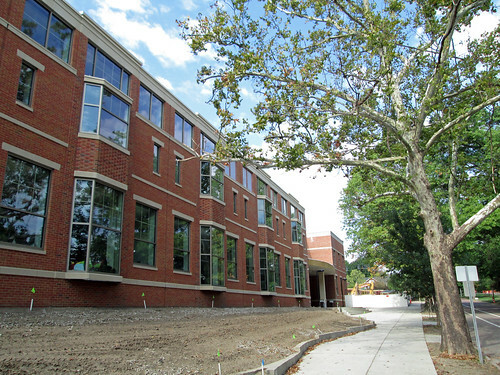 The completed new building presents an attractive facade on Wydown with a significantly increased quantity of windows in comparing to the old building. A view along University Lane at the east end. The new school has a large V shaped courtyard between two main classroom wings which will allow plenty of daylight into the building. 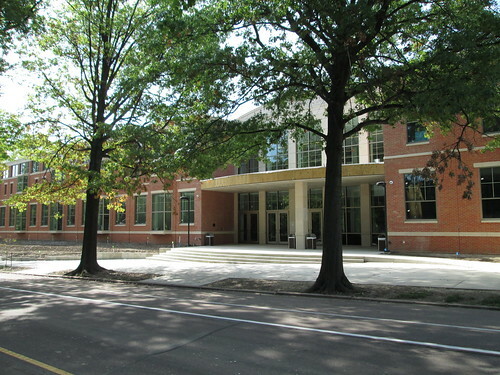 Although a few mature trees were destroyed in front of the current demolition site, a row of trees was preserved in front of the new building, which greatly improves the streetscape. 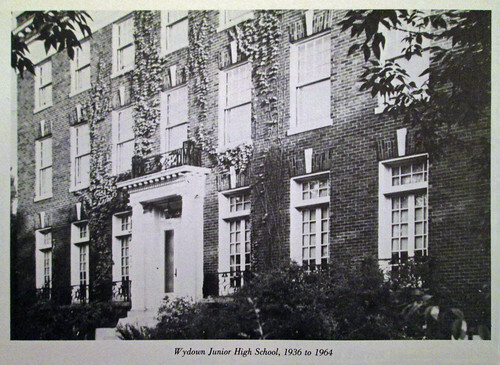 The recently demolished Wydown Middle School was not the first school on the site. In 1918, the building pictured above was constructed for Hosmer Hall, a private girls school that had been founded in St. Louis in 1884. Hosmer closed in 1936, after which the City of Clayton purchased it to relieve overcrowding at the old Clayton High School on Forsyth. 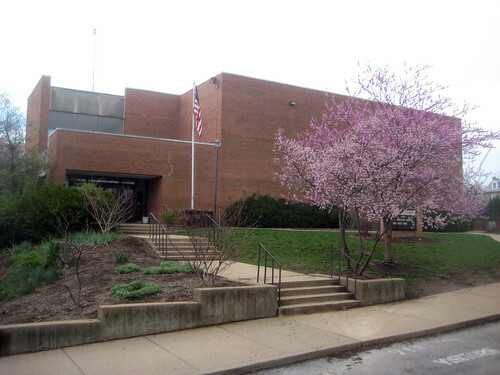 It was used as a 9th grade center, then an 8th grade center and was demolished after the Wydown Junior High School (name changed to Middle School in 1988) was built in 1965. 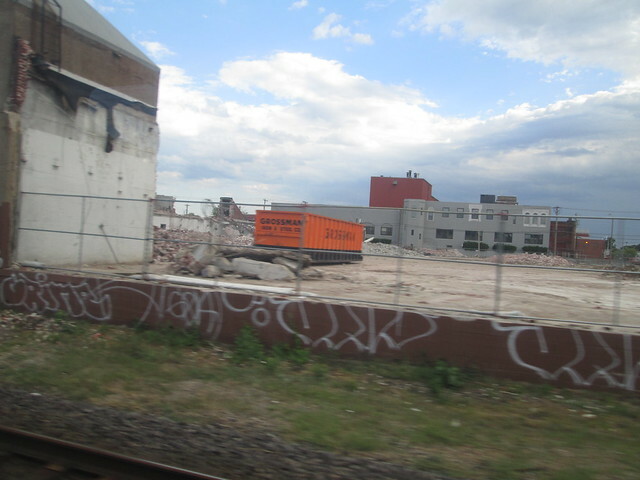 CORTEX is currently demolishing a group of one and two story factory and warehouse buildings along Clayton Avenue. 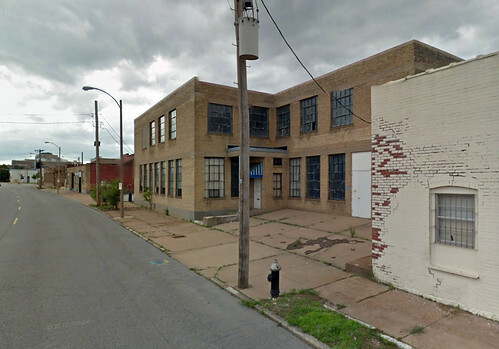 The buildings occupy are immediately adjacent to the location of a proposed new MetroLink station that could be built just east of Boyle Avenue. While the site is currently owned by CORTEX, according to Phase 2 plans for the life sciences R & D district highlighted by Next STL in May, BJC plans to build a 200,000 square foot building potentially opening next year. Just across the MetroLink tracks, Wexford Science & Technology plans complete a historic rehabilitation of the former Western Electric building at 4250 Duncan. 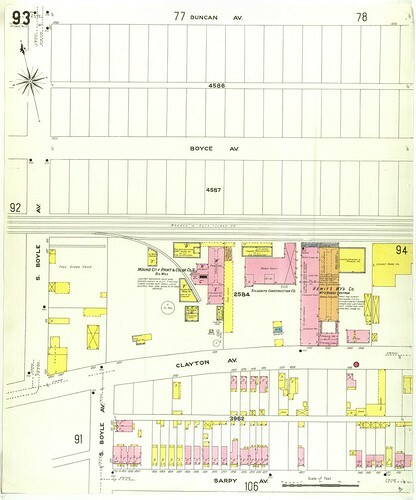 Most of the complex dates from the 1940's, but according to the Sanborn map below, a brass casting foundry from the Hewitt Manufacturing Company and a wagon house from the Gilsonite Construction Company date from at least 1909. These buildings are thedark grey roofed portions of the complex on either side of the white roofed portion in the aerial photo above. Most of the complex facades fronting Clayton Avenue are very non-descrpt utilitarian buff brick boxes with very little ornamentation. 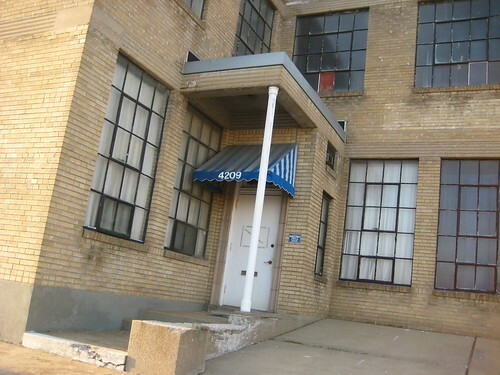 The portion of building at 4250 Clayton Avenue has very subtle streamline detailing with a ribbed concrete band running across the first floor windows and entrance canopy. The same detail runs along the heads of the second floor windows as well. 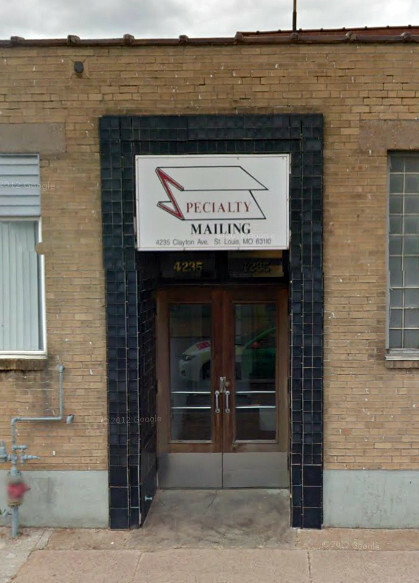 The entrance at 4235 Clayton featured a simple black glazed tile surround that had a slightly Moderne feel. The rest of this portion of the building was completely devoid of ornament. As of this evening, about a third to half the complex has been cleared. The buildings were clearly in a condition where they could be renovated, but their lack of architectural significance or any obvious other distinction would make them difficult to list on the National Register, which would make them eligible for tax credits. If BJC's new 200,000 square foot building comes to fruition then I would not fret over the loss of these buildings. 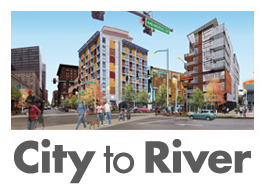 This is the opposite of the situation that occurred last year at Forest Park Boulevard & Vandeventer, where CORTEX demolished a prominent building that could have been listed and had no clear plan for the site. Directly across Clayton Avenue from the current demolition site sits this building. Its facade appears to be Mediterranean Revival style (although altered), which is somewhat odd for the building type in an industrial area. 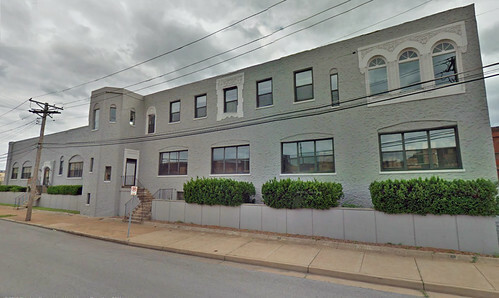 The City's property database shows it as two buildings with one half from 1910 and one from 1931. My guess is the east half is older since Mediterranean Revival was not popularized nation wide much until the 1920's. The building is not owned by CORTEX.